Kryptel Standard 7.4.1 was available as a giveaway on February 6, 2017! How would you improve Kryptel Standard 7.4.1? Installed & Registered quickly and easily. No time to play with it right now, but looks and sounds quite interesting. For those asking where to put the license code in, there should have been a grey colored popup from the program asking for the Customer Id Code, and other stuff like use the trial, and whatever. You cant open the program without addressing that page. Its in the middle of that page. Almost missed it myself. Uninstall and reinstall if you have time. Win 7 x64. 'm asking all data geniuses for help to acces TrueCrypt with the lost password is about 35 key strokes. No password files kept. Online there are only hints that it is possible in Linux, but I only have Win7 and Win10. Please describe in detail how to open my TrueCrypt file or give the link to the detailed description of how safe to do it. According to the online informations ,TrueCrypt is not secure, but nobody says how to reset the password. Edgar, You can not reset your password. It was necessary to record it. Edgar, You can not reset your password. It was necessary to record it. I'm asking all data geniuses for help to acces TrueCrypt with the lost password is about 35 key strokes. No password files kept. Cannot activate mobile version, on Customer ID code: "No appropriate license found". hardgirl, select 'Start / All Programs / Kryptel / License Manager'. I skimmed through the comments, and I apologise if this was already answered. 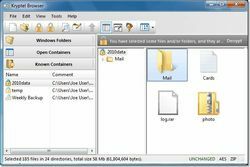 Can an entire drive be encrypted, or is it limited to files and folders? richard tarno, files and folders. 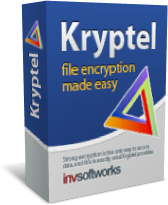 Kryptel support, What maximum size of folder can be encrypted? I used the portable version. And send it by mail to another mail-address; both gmail. I think, there's no difference and also quite easy to use. And encrypting and decrypting is done on your own PC. And to be sure: keep the original and encrypt it on a PC with not internet and decrypt it on a PC with no internet. Mail I used the portable version. I made something: https://dl.dropboxusercontent.com/u/10366431/_GOTD/KryptelStandard741_20170206/TestPaintNet-Org.png Encrypted it: https://dl.dropboxusercontent.com/u/10366431/_GOTD/KryptelStandard741_20170206/TestPaintNet.edc And send it by mail to another mail-address; both gmail. I downloaded the file and decrypted it: https://dl.dropboxusercontent.com/u/10366431/_GOTD/KryptelStandard741_20170206/ViaMail.png Result: https://dl.dropboxusercontent.com/u/10366431/_GOTD/KryptelStandard741_20170206/TestPaintNet-Mail.png I think, there's no difference and also quite easy to use. And encrypting and decrypting is done on your own PC. And to be sure: keep the original and encrypt it on a PC with not internet and decrypt it on a PC with no internet. We archive family documents (copies of Wills, birth and death certificates, etc) together with personal financials on an external hard drive that connects to our desktop computer via USB. Recently we sampled a privacy / security product (not Kryptel) which promised to encrypt and hide to the extent that no-one would even be aware of an archive's existence. We installed the product as directed in 'portable' guise. It wrote itself to the desktop and put separate stuff on the root of the external drive. So as soon as that drive was connected, a mysterious executable was instantly apparent (and even if marked hidden, could quickly have been made apparent) as well as a folder bearing the product's name. Re-naming the exe corrupted the file as did renaming the folder. Moving either or both from the root to any other folder so as prevent them from being instantly detectable wrecked the software's operation. So far, the only thing we've found which works is zip encryption. But oh Lordy, how sloooooow and clunky this method is if needing to decrypt and open and add to or extract from. Having tried but failed to get the hang of Safehouse Explorer (our fault, not the software's) we've given up on trying to hide an archive so would now like to try something which encrypts / decrypts without husband and I reaching pensionable age in the meantime. What we can't figure out from the information here is if Kryptel is suited to our particular needs: we would never, ever keep an important archive on our main desktop, only on the external hard drive which is connected up infrequently. If Kryptel can manage this, then is it a 'portable' version we need or, or. . . ? Advice would be appreciated. Thank you. 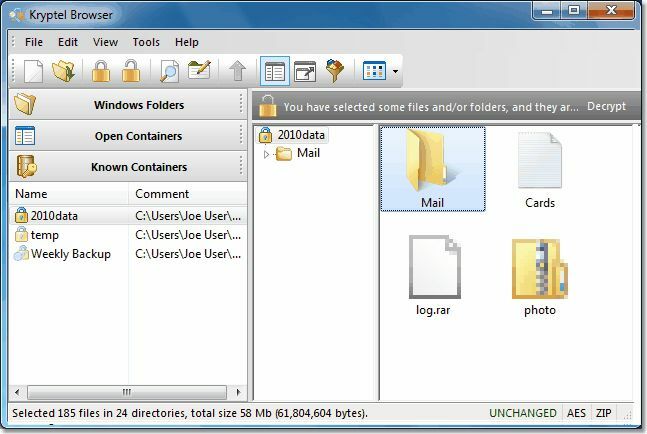 We archive family documents (copies of Wills, birth and death certificates, etc) together with personal financials on an external hard drive that connects to our desktop computer via USB. Recently we sampled a privacy / security product (not Kryptel) which promised to encrypt and hide to the extent that no-one would even be aware of an archive's existence. We installed the product as directed in 'portable' guise. It wrote itself to the desktop and put separate stuff on the root of the external drive. So as soon as that drive was connected, a mysterious executable was instantly apparent (and even if marked hidden, could quickly have been made apparent) as well as a folder bearing the product's name. Re-naming the exe corrupted the file as did renaming the folder. Moving either or both from the root to any other folder so as prevent them from being instantly detectable wrecked the software's operation. So far, the only thing we've found which works is zip encryption. But oh Lordy, how sloooooow and clunky this method is if needing to decrypt and open and add to or extract from. Having tried but failed to get the hang of Safehouse Explorer (our fault, not the software's) we've given up on trying to hide an archive so would now like to try something which encrypts / decrypts without husband and I reaching pensionable age in the meantime. What we can't figure out from the information here is if Kryptel is suited to our particular needs: we would never, ever keep an important archive on our main desktop, only on the external hard drive which is connected up infrequently. If Kryptel can manage this, then is it a 'portable' version we need or, or. . . ? Advice would be appreciated. Thank you. Claire, you need the desktop version. It can work with any drives, portable or fixed. 'Desktop' means that it should be installed on a particular computer and can't be moved. The portable version is to be installed on a USB stick (or any other removable drive). It is rather limited, but you can use it on any computer, just insert the flash stick, and you are up and running. Like the desktop version, it can access files on any drive. Claire, you need the desktop version. It can work with any drives, portable or fixed. 'Desktop' means that it should be installed on a particular computer and can't be moved. The portable version is to be installed on a USB stick (or any other removable drive). It is rather limited, but you can use it on any computer, just insert the flash stick, and you are up and running. Like the desktop version, it can access files on any drive. I love what I see so far. Just have a question .... If I encrypt a file and put a password only know to me, can someone with Kryptel use the included browser to open / read my file? No one will be able to access your data without knowing the right password. Kryptel support, Thank you for the timely response. That was my only question. I love this offering and feel great about it. Folks may want to realize that any encryption software is open for manipulation by the "software giants" because bypassing encryption is actually a huge money maker for a large number of people, companies, etc. Anyway, thank you again GOTD for the awesome application for today. Kryptel support, Thank you for the timely response. That was my only question. I love this offering and feel great about it. Folks may want to realize that any encryption software is open for manipulation by the "software giants" because bypassing encryption is actually a huge money maker for a large number of people, companies, etc. Anyway, thank you again GOTD for the awesome application for today. Still impossible to activate the program, when i try it says "Product Activation isn't responding" Can't make connection ... Hope you can help me with it .... Thanks in advance ! Hanzo, the activation server is up and running. There may be a network problem somewhere in the middle. Please try again tomorrow. If the problem persists, try turning off your firewall and antivirus. This program has very good reviews on cnet, although the reviews are from 2009. I believe that it must have only become better over time. Installed free SilverKey on USB. It works as promised. 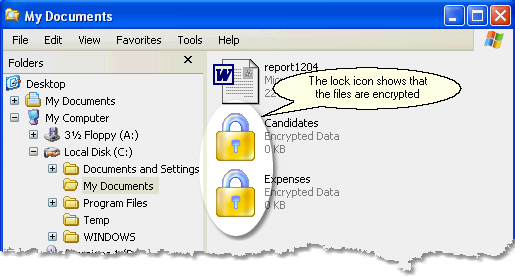 Creates encrypted files, that can be self extracting or through software. And it was extremely fast, almost the speed of copying and pasting. The installed SilverKey folder can be moved successfully from one USB to another. The same USB installed software works under different enviroments, Win 10 and Win 8.1 in my case. Installed Kryptel Std Portable on USB key and activated with today's password. It would be wrong to say that there is no learning curve, but yes it can be used out of the box. The installed software loses activation if moved from one USB to another, or moved back to itself. Which means that if the USB is formatted, which is not unlikely, then it will lose the software. However, the installed portable software could be used on different pc with different OS (Win 10, Win 8.1). Do not intend to install full desktop version, just my apprehensions. Do not know how the password protected zip files compare to this exquisite software. I am sure they are less secure but should they be enough for home user like me. Overall a very good and fuctional software, for people who need it. This program has very good reviews on cnet, although the reviews are from 2009. I believe that it must have only become better over time. Installed free SilverKey on USB. It works as promised. Creates encrypted files, that can be self extracting or through software. And it was extremely fast, almost the speed of copying and pasting. The installed SilverKey folder can be moved successfully from one USB to another. The same USB installed software works under different enviroments, Win 10 and Win 8.1 in my case. Installed Kryptel Std Portable on USB key and activated with today's password. It would be wrong to say that there is no learning curve, but yes it can be used out of the box. The installed software loses activation if moved from one USB to another, or moved back to itself. Which means that if the USB is formatted, which is not unlikely, then it will lose the software. However, the installed portable software could be used on different pc with different OS (Win 10, Win 8.1). Do not intend to install full desktop version, just my apprehensions. Do not know how the password protected zip files compare to this exquisite software. I am sure they are less secure but should they be enough for home user like me. Overall a very good and fuctional software, for people who need it. This looks like a nice program, though I can't trust that there isn't a "backdoor" or password recovery option without a public source code. How do I know my information is safe from Kryptel? No offense to Kryptel, but personally I have to know. "I can't trust that there isn't a "backdoor" or password recovery option without a public source code." To me personally, open source just doesn't mean near as much as it used to when it comes to security. Security experts are continually finding new vulnerabilities, either on their own or by analyzing what cyber criminals &/or spies are doing. All the security patches we should be installing, e.g. for Windows, cover not just mistakes made writing the original code, but sometimes [often] stuff security experts never thought of let alone spotted. So assuming you could get the very best security folks to audit whatever open source software, there's simply no guarantee IMHO that they'd find every potential weakness or vulnerability. There's also the possibility that some widely used encryption standards are compromised. Agencies like the NSA allegedly corrupted older standards *that we know about*, & so **may** have had some input into some of the newer current standards as well. Snowden & Shadow Brokers are 2 examples of how stuff the NSA has gets into the public realm, & there's no telling if there were/are less well publicized data thefts. If that isn't depressing enough, the very best experts at this stuff can make loads of money selling ways they've developed to get around encryption &/or other security measures. There are private companies that act as cyber arms dealers, who have publicly offered millions of dollars for this sort of thing. While they supposedly only sell to gov agencies, e.g. the software the FBI bought from one of these dealers to get into a terrorist's iPhone, they also get hacked -- at least some of the wares from the company the FBI dealt with for the iPhone have been publicly released. A subject of controversy, if an agency like the NSA finds an exploit in use, they may keep it for themselves rather than notifying anyone to fix it. Voodoogodman, our technical docs are open, you can check them, and we'll be happy to answer any question. We are considering publishing our sources sooner or later, but it is not a priority job. Our users are simply not interested. mike, I agree with you regarding all the "back door" issues related to security. Especially, when it involves high profile agencies of the government, etc. However, I believe that anything offered to the public will have the same issues regardless of what information is marketed, promoted, etc. With that said, I love todays giveaway. Thank you GOTD and thank you everyone that adds comments to the daily giveaway because I read all of them and tbh I've learned a great deal from the summaries folks post here. mike, I agree with you regarding all the "back door" issues related to security. Especially, when it involves high profile agencies of the government, etc. However, I believe that anything offered to the public will have the same issues regardless of what information is marketed, promoted, etc. With that said, I love todays giveaway. Thank you GOTD and thank you everyone that adds comments to the daily giveaway because I read all of them and tbh I've learned a great deal from the summaries folks post here. Can't activate the program, can't connect to the Kryptel server it says ..... Timed out .. tried it several times in last hour already with same result ???!!! Hanzo, seems like the activation server got overflowed. We have cleared the activation list, please try again. A question: is there a MAC and/or a Linux version of this software? Many people say: I do not need to encrypt anything. I keep everything at home. Me too. Last year at 04.00 I woke up from a strange noise and a moment later the light in the hallway went on??? The front door was broken open. Another incident: a employee had taken papers/dossier of 150 patients from the hospital home and the harddrive was missing. Not encrypted and he is now looking for a new job. Or the director of a firm was easy, lazy and automatically logged in with his notebook: in the firm and at home. That notebook was stolen, because somebody smoked a cigarette outside and left the door open. I got a notebook for free, because it was secured: the start-up was secured by BIOS, the HD was secured by password and Windows also. After 2 day's work I did have a nice notebook: password was simple like 1234. The free-version of the software could decrypt this file. A question: is there a MAC and/or a Linux version of this software? And do not encrypt system-files: https://dl.dropboxusercontent.com/u/10366431/_GOTD/KryptelStandard741_20170206/GevaarlijkeActie-3.png Result: https://dl.dropboxusercontent.com/u/10366431/_GOTD/KryptelStandard741_20170206/GevaarlijkeActie-3-Gevolg.png Many people say: I do not need to encrypt anything. I keep everything at home. Me too. Last year at 04.00 I woke up from a strange noise and a moment later the light in the hallway went on??? The front door was broken open. Another incident: a employee had taken papers/dossier of 150 patients from the hospital home and the harddrive was missing. Not encrypted and he is now looking for a new job. Or the director of a firm was easy, lazy and automatically logged in with his notebook: in the firm and at home. That notebook was stolen, because somebody smoked a cigarette outside and left the door open. I got a notebook for free, because it was secured: the start-up was secured by BIOS, the HD was secured by password and Windows also. After 2 day's work I did have a nice notebook: password was simple like 1234. Just for a test: can anyone find the password of this file. It's a text-file: https://dl.dropboxusercontent.com/u/10366431/_GOTD/KryptelStandard741_20170206/syslinux.edc Put some letters here like .o.....7.... The free-version of the software could decrypt this file. Ootje, no Mac or Linux support, sorry. The only way to run Kryptel on Mac is to use an emulator for Windows programs (AFAIK there are several). A version for other OS will put your program better on the market. Now you have to know what OS the receiver uses. And most people will use something that every OS can handle. Kryptel support, A version for other OS will put your program better on the market. Now you have to know what OS the receiver uses. And most people will use something that every OS can handle. Can this program be used to encrypt files that you're sending to other people for them to open? Sometimes one sends files that need to be encrypted because they contain sensitive information and one might not want that email being intercepted by others trying to gain that sensitive info (i.e. credit info). Can this program be used to encrypt files that you're sending to other people for them to open? Sometimes one sends files that need to be encrypted because they contain sensitive information and one might not want that email being intercepted by others trying to gain that sensitive info (i.e. credit info). Thanks! Jennifer, yes, of course, you can send encrypted file to another person. However our other product Silver Key http://www.kryptel.com/products/silverkey.php fits the task better (Silver Key giveaway event is planned for March). Jennifer, I do not have any experience, but why not? The other person can use the free version to open it. Maybe later on I will test it. I have today two computers working and also 2 mail-adres. Jennifer, I do not have any experience, but why not? The other person can use the free version to open it. Maybe later on I will test it. I have today two computers working and also 2 mail-adres. Kryptel support, Thank you! I guess I will wait till March then. I did a test and that went well. Jennifer, I did a test and that went well. If you want to play around with Kryptel standard make sure to change the settings of the program to keep a copy the source file. If you want to play around with Kryptel standard make sure to change the settings of the program to keep a copy the source file. Take care. StrayCat, if you keep the source files, this make encryption sort of useless. Actually, the danger of data loss is zero, Kryptel does not delete anything until the resulting file is successfully created. 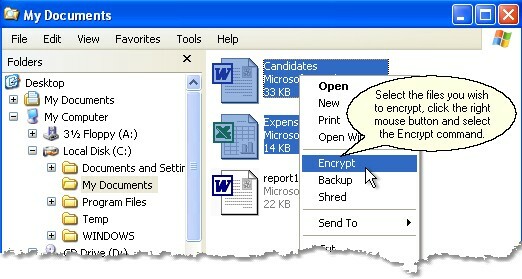 Encrypted backup is another story - by default Kryptel does not delete the source files when creating backup. StrayCat, if you keep the source files, this make encryption sort of useless. Actually, the danger of data loss is zero, Kryptel does not delete anything until the resulting file is successfully created. Encrypted backup is another story - by default Kryptel does not delete the source files when creating backup. Are there any backdoors in this software? I know as of 2013, backdoors are no longer required, but they are requested. Tim, no backdoors. Our file formats are fully documented, you can find all technical info on our Web site, in 'Articles'. How can I access the Customer Control panel ? sophivan, you can't. This Customer ID belongs to GAOTD, not to individual users. What do you need to access it for? The Customer Panel has nothing to do with software itself, it is for orders and licenses. sophivan, you can't. This Customer ID belongs to GAOTD, not to individual users. What do you need to access it for? The Customer Panel has nothing to do with software itself, it is for orders and licenses. sophivan, I do understand you quite well, but do you mean this? Do you need to use the enter version when the system crashes due to a system crash or error? "The software is required to be downloaded, installed and registered exceptionally during the giveaway period". If you reinstall your system or upgrade your computer, you will not be able to re-activate the program. You will need to buy it or to wait for another giveaway. Of course, you will be able to decrypt your files no matter what. santonio, you will not be able to re-activate after the giveaway event is over, that is the standard GAOTD condition: https://www.giveawayoftheday.com/terms.html "The software is required to be downloaded, installed and registered exceptionally during the giveaway period". If you reinstall your system or upgrade your computer, you will not be able to re-activate the program. You will need to buy it or to wait for another giveaway. Of course, you will be able to decrypt your files no matter what. Kryptel support, thanks for prompt answer. I did not install the portable version on fixed drive, I installed the main version to my fixed drive and it works. Than I copied portable version to my 8 GB flash stick and the aforementioned problem arose. Kryptel support, thanks for prompt answer. I did not install the portable version on fixed drive, I installed the main version to my fixed drive and it works. Than I copied portable version to my 8 GB flash stick and the aforementioned problem arose. luppusi, does your system recognize your flash stick as a removable drive? That is, does the 'Safely remove..." icon appear in the bottom right corner (where time is shown)? The only reason for that error is running the program from inappropriate device (another reason is a wrong license, but it is not the case obviously). 2) You run the program by double-clicking 'Kryptel.exe' in the root folder, not anything in the 'Kryptel' subfolder. 3) You activated the program with Customer ID code "9533-48707-0522" (without quotes). luppusi, does your system recognize your flash stick as a removable drive? That is, does the 'Safely remove..." icon appear in the bottom right corner (where time is shown)? The only reason for that error is running the program from inappropriate device (another reason is a wrong license, but it is not the case obviously). Please also make sure that 1) You unzipped the file into the root folder of your USB stick, 2) You run the program by double-clicking 'Kryptel.exe' in the root folder, not anything in the 'Kryptel' subfolder. 3) You activated the program with Customer ID code "9533-48707-0522" (without quotes). The problem arose on flash drive with FAT32 file system.. When I used exFAT flash drive Kryptel worked. Now I'll try another on NTFS flash. Have copied portable version to usb and eventually activated it. But how do I run it and use it? Does this version allow users to restore data from corrupted encrypted containers? It looks like it does not, although the blurb here says the opposite.! Mario: No, the Standard edition does not include the Data Recovery component (the product description is common for all the editions). However all the editions, even the free one, do create recovery descriptors during encryption. In case of need you will be able to recover files using the trial version, which is in fact the time-limited Enterprise edition. If somebody(who shouldn't) can access a user's important documents/files, then his system is already in a big trouble, and if nobody can, then why he needs to encrypt his files? Just for the sake of encrypting them? Zip programs that you use to extract the files downloaded from this site can also encrypt your data, so why pay for extra programs? "You do not need cryptic passwords anymore – a finger from the user is sufficient for a secure login. Previous ThinkPads were equipped with fingerprint scanners as well, but later models use modern touch instead of the old swype-style scanner. A short press with the fingertip is enough to unlock the device within fractions of a second. Easy, reliable and fast." Tranmontane, fingerprints have too few combinations and so produce extremely weak keys. Computing power of a mobile phone should be sufficient to bruteforce such a key in minutes. Interesting.... Then would a seven- or eight-figure number/letter combination make it much more secure?? Or does one practically need a whole "sentence"? Obviously not one consisting simply of words that one can find in a dictionary. Kryptel support, Interesting.... Then would a seven- or eight-figure number/letter combination make it much more secure?? Or does one practically need a whole "sentence"? Obviously not one consisting simply of words that one can find in a dictionary. Tranmontane, no, this won't help much. Say, you will need a desktop computer instead of a mobile phone. Fingertips are ok for identification but not for encryption. I have been using this software since it was given away here a few years ago. I use it to encrypt all my passwords anf some private information and notes that i keep others from accessing. It's self extracting so i also keep it in a thumbdrive. I like it and will use it. My question is if i need to uninstall the version i have or this newer one will do the job? Thank you Kryptel. I feel safe with this product. Just installed this software and the GUI looks very inspiring perhaps i'll use this software for more security. Kryptel support, yes i do have important files. I can only think of using this software in an environment where i have to share my files and hardware. Once my files are in cloud, i don't need to encrypt. Because no one will know the link, but i can use extra security to make my file null and void for others. hmmm Just installed this software and the GUI looks very inspiring perhaps i'll use this software for more security. Kryptel support, I carry a USB flash drive with a backup of my Thunderbird email profile. This is encrypted using Kakasoft USB Security. This is very fast. It may not be as secure as Kryptel but its adequate and so much faster! momo, do you use the AddOn WOT? Svend Ostergaard, .......Your PC can be stolen!...the world is coming to an end....No electricity more.....you die.......a new PC......What does that statement to do with the program? momo , Is your home pc connected to Internet? Do you know that Microsoft have access to all your files? Even turning off updates (not possible in W10) is not enough. You must stop using Facebook, Twitter, WhatsApp and other similar accounts. Then you must avoid using search facilities like Google, Bing, Yahoo etc. Furthermore you must use open source applications only, and/or develop your own applications as we used to do years ago in order to be really sure that nobody is sniffing your activities and private documents. But that's not enough. The best and only secure measure is to turn off your Internet connection. On top of all that you must crush your smartphone. Do you know that the Russian FSO uses typewriters to write particularly sensible documents in order to avoid interception? That's because more than one hundred world leaders and key officials are spied by the NSA. And that's why Germany, Russia, Brazil, China, UK etc., developed or are developing secure communication networks outside of the public networks. Somewhat paranoid? Yes. This is the world where we live. If you are not aware of that, you can read any of the many books and articles available on the subject. To begin with I recommend you watch the film: Snowden. Yes man, the Assange and Snowden ordeals are not urban legends. The last line: Take your own measures but remember that you must know how computers and cyberspace work to take the appropriate measures in order to reasonable stay in the safe side. momo , Is your home pc connected to Internet? Do you know that Microsoft have access to all your files? Even turning off updates (not possible in W10) is not enough. You must stop using Facebook, Twitter, WhatsApp and other similar accounts. Then you must avoid using search facilities like Google, Bing, Yahoo etc. Furthermore you must use open source applications only, and/or develop your own applications as we used to do years ago in order to be really sure that nobody is sniffing your activities and private documents. But that's not enough. The best and only secure measure is to turn off your Internet connection. On top of all that you must crush your smartphone. Do you know that the Russian FSO uses typewriters to write particularly sensible documents in order to avoid interception? That's because more than one hundred world leaders and key officials are spied by the NSA. And that's why Germany, Russia, Brazil, China, UK etc., developed or are developing secure communication networks outside of the public networks. Somewhat paranoid? Yes. This is the world where we live. If you are not aware of that, you can read any of the many books and articles available on the subject. To begin with I recommend you watch the film: Snowden. Yes man, the Assange and Snowden ordeals are not urban legends. The last line: Take your own measures but remember that you must know how computers and cyberspace work to take the appropriate measures in order to reasonable stay in the safe side. Adrian, what on Earth does your statement have to do with the program OR the previous commentor's reply? While neither was in the best tone, their's at least is relevant to today's offer and why one would need such a program, while yours was not. Whisperly, that was an answer to Svend Ostergaard. Once watched the trial and that's not for me. Whisperly, that was an answer to Svend Ostergaard. Once watched the trial and that's not for me.